Lower Manhattan is the home of the financial district of Manhattan, located at the southern tip of the island with the Hudson River on the west, the East River on the east, New York Harbor to the south, and Chambers Street on the north. It is one of the two largest business districts in New York City - the other being Midtown Manhattan - and is the historical core of the modern city; a fact reflected in the convoluted street pattern compared to the regular streets and avenues found uptown. Lower Manhattan is home to some of New York's most famous and evocative landmarks: Wall Street, the Brooklyn Bridge, as well as the Statue of Liberty on Liberty Island and Ellis Island in the harbor, both accessed by ferry boat from the financial district. Located at the southern tip of Manhattan, Lower Manhattan was the site of earliest European settlement in the New York area - the Dutch settlement of New Amsterdam. Established in 1625, the settlement became the capital of New Netherland, the colonial Dutch province which controlled the area along the Hudson River. In 1664, the British conquered New Netherland and New Amsterdam became "New York". In the late 18th century, with the American Revolution brewing, New York became a major political center for the colonists. Protests against the Stamp Act led the so-called "Stamp Act Congress" to convene here and sign a Declaration of Rights and Grievances, asserting the concept of "no taxation with representation." British soldiers captured New York and maintained control of the city until the war ended, when George Washington triumphantly returned to Manhattan. He would return again in 1789 to take the oath of office and become the nation's first president, as New York briefly served as the first capital of the United States, where the Bill of Rights was drafted and ratified. Shortly after the creation of the United States, Lower Manhattan started becoming an economic and financial center for the new nation. In 1792, a group of stock brokers signed the Buttonwood Agreement, which created the New York Stock Exchange, underneath a buttonwood tree at 68 Wall Street. In the late 19th and early 20th centuries, the corporate culture of the area fueled the construction of many skyscrapers in the district, and as the financial power of New York grew, so did its influence; as evidenced by the 1929 Wall Street Crash, which ushered in the Great Depression. Through the 1940s and 50s, new economic growth on Manhattan was centered on Midtown. Wishing to concentrate new growth on Lower Manhattan, and coming in at the height of the urban renewal movement, local leaders destroyed most of the old structures to make way for the gleaming office towers of today's Lower Manhattan, not least of which was the World Trade Center, built in the 1970s, which defined the Lower Manhattan landscape until it was destroyed on September 11, 2001. Currently, a new World Trade Center is being constructed on the site alongside the new memorial to the September 11 victims. Since the 2008 financial crisis, the demographic makeup of Lower Manhattan has been changing markedly as the dominant financial services sector has downsized. With many firms reducing their office footprint, or relocating to Midtown or New Jersey, this has encouraged media and technology companies to take up the slack in the area - symbolized most notably perhaps by publishing giant Conde Nast's relocation to the new World Trade Center. As a result many older office buildings have been converted to residential use, bringing the area's resident population to a level not seen for decades, with new restaurants, bars, stores and other facilities springing up to service the influx of new residents and workers. With these new developments, Lower Manhattan is beginning to lose its former reputation for being a strictly "9-to-5", "Monday-Friday" area of New York. Lower Manhattan has an irregular street grid system, a throwback to the original Dutch settlement of New Amsterdam. This street pattern seems even more irregular when compared to the neat grid system seen just about everywhere else in Manhattan. 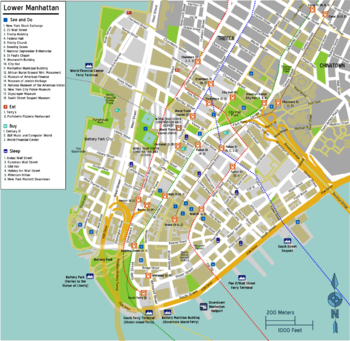 Major avenues here run in a north-south direction - West St along the Hudson River, Church St and Broadway through the middle of the district, and Water St and South St (the former running beneath the elevated FDR Drive) along the East River. With the exception of these roads, almost every street in the financial district is very narrow and often clogged with traffic during the day. The blocks immediately surrounding the intersection of Wall and Broad Sts (where the stock exchange and Federal Hall are located) are blocked off to automobiles; only pedestrians may enter. Most of the city's subway lines have stops in lower Manhattan - they converge at either the World Trade Center or the Fulton Center (both of which will be eventually linked together below ground), making it one of the best ways to get to the district. There are few express stations in the area, so most trains will stop at every station in this neighborhood. Though many city bus lines serve the area, traffic is often slow on the winding streets. The 1, 2, 3, 4, 5 and 6 lines connect the district to Uptown and the Bronx, with the 2, 3 and 4 also running to Brooklyn under the East River (along with the 5 during rush hours). The A and C lines run Uptown and east out to Brooklyn, with the A continuing to the JFK Airport area. The E runs alongside the A and C lines to Midtown, where it breaks off and runs out to Queens. The R heads north to Midtown, Queens, and east to Brooklyn. Finally, the J and Z lines head northeast to Brooklyn and Queens, but be aware that Broad St and the J/Z section of Fulton St are closed on weekends. Additionally, PATH subway trains connect the World Trade Center site to New Jersey. There are two lines: one to Newark and one to Hoboken, both stop in Jersey City, the latter returns north and back across the Hudson to Manhattan and terminates in the West Village. The PATH costs $1.75 per ride and accept MetroCard for payment. There is a free circular bus around Lower Manhattan called the Downtown Connection . The Staten Island Ferry  connects the South Ferry terminal, located at the southern tip of Manhattan, to the St. George Ferry Terminal on Staten Island. The ferry is absolutely free and is popular for tourists since the route offers excellent views of Lower Manhattan and the Statue of Liberty. The ferry runs 24 hours a day, usually running at 30 minute intervals, with more running during rush hours and fewer running at very late hours. NY Waterway  operates ferry services from the World Financial Center ferry terminal and the Pier 11/Wall St. ferry terminal to several points in New Jersey along the Hudson River, including in Hoboken and Weehawken. Fares vary by route. New York Water Taxi  operates ferry services from World Financial Center, Battery Park, Pier 11/Wall St. and the South Street Seaport to points in Midtown, Brooklyn, Queens, Yonkers, and Breezy Point. Their boats are painted to look like taxis and fares vary by route. Lower Manhattan is the primary gateway to three islands in New York Harbor: Liberty Island (home to the Statue of Liberty), Ellis Island, and Governors Island. Another ferry runs to Liberty and Ellis Islands from Liberty Park in Jersey City, but most tourists use the Manhattan ferries. These are some of the most popular destinations in New York City and access is available only by ferry boat. If you're visiting New York on a budget or you don't want to wait for hours to get near the Statue of Liberty, you may want to consider taking the Staten Island Ferry , which is absolutely free and offers excellent views of the Statue of Liberty from its route to Staten Island from the South Ferry Terminal, just east of Battery Park. Ferries depart from Battery Park (New York) or Liberty State Park (New Jersey), ☎ +1-212-269-5755 (toll free: +1-866-782-8834), . 8:30AM-5:15PM (hours adjusted seasonally); if you leave after 2PM, you will only be able to visit either Liberty Island or Ellis Island. Ferry ride $12, $10 seniors (62+), $5 children (4-12). Crown Access $3 extra. Audio Tours $6 extra. 1) Reserve Ticket – includes ferry transportation; provides access to Liberty Island and Ellis Island, including the grounds of Liberty Island and the Ellis Island Immigration Museum. The Reserve Ticket allows you to save time when waiting for the ferry; instead of waiting on the longer line, the Reserve Ticket allows you to go through the priority entrance at the security check-in. The Reserve Ticket does not allow entry into the Statue of Liberty, the Statue of Liberty Museum (located in the pedestal), the Pedestal Observation Deck, or the Crown. The cost of the Reserve Ticket is the same as the Ferry ride; there is no additional cost for the Reserve Ticket. 2) Reserve with Pedestal/Museum Ticket (does not include Crown Access) – includes ferry transportation; in addition to the access that is provided with the Reserve Ticket, this ticket also allows access to go inside the pedestal; see the interior structure of the statue; take in sweeping 360-degree views from the Pedestal Observation Deck; and access Fort Wood (the 11-point star-shaped structure the statue stands upon). The Reserve with Pedestal/Museum Ticket does not include access to the Crown of the Statue of Liberty. This ticket has "Monument" printed on it (for Monument Access). Prior to entering the pedestal, there is a secondary security screening. The cost of the Reserve with Pedestal/Museum Ticket is the same as the Ferry ride; there is no additional cost for the Reserve with Pedestal/Museum Ticket. Tickets should be purchased days, weeks, or months in advance, depending on the time of year. 3) Reserve with Crown Ticket (includes Pedestal/Museum Access) – includes ferry transportation; in addition to the access that is provided with the Reserve with Pedestal/Museum Ticket, this ticket also allows access up to the Crown of the Statue of Liberty. Visitors to the crown will be required to go through a secondary security screening. The Reserve with Crown Ticket costs an additional $3. Reserve with Crown Tickets are very limited and should be obtained three or four months or longer (up to one year) in advance. 4) Flex Ticket is valid for a one-time use within a three day period. The Flex Ticket includes ferry transportation and provides the same access that is provided with the Reserve Ticket; the Flex Ticket does not allow entry into the Pedestal, Museum, or Crown. The Flex Ticket requires a specific start date for purchase. With the Flex Ticket you can arrive at any time of the day, but early arrival is suggested for the security check-in queue. The Flex Ticket does not allow priority entry at the security check-in (Reserved Ticket entrance). Pedestal/Museum Access or Crown Access may not be ordered online with the Flex Ticket. Tickets can also be purchased through concierges at major hotels and at the ticketing windows in the Castle Clinton National Monument inside Battery Park, New York, or inside the Central Railroad of New Jersey Terminal in Liberty State Park, Jersey City, New Jersey. Monument Access (for the Pedestal/Museum/Crown) may not be available if you purchase your tickets on the day of your visit. Note: There is a separate Reserved Ticket entrance (at the security check-in) for the Reserve Ticket, Reserve with Pedestal/Museum Ticket, and Reserve with Crown Ticket. If you purchase one of these reserved tickets, then you can take advantage of this priority entry (Reserve Ticket entrance) and you could easily save an hour of waiting during busy times. The Flex Ticket does not allow priority entry at the Reserve Ticket entrance. 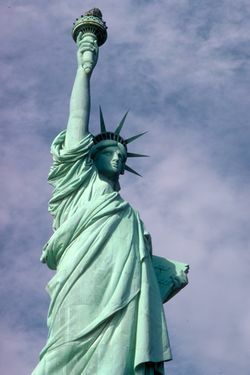 Statue Cruises is the only means of access to Liberty and Ellis Islands; the ferries depart from Battery Park at the southern tip of Manhattan or from Liberty State Park in Jersey City. Be prepared for airport like security screening with similar restrictions (no food or open liquids, no knives, etc.) before boarding the boat. One ticket is good for sailings to both islands and return to starting point. Tickets are limited in number and can be obtained on the day from the ferry company or in advance by calling the ticket office on the phone number above or online . 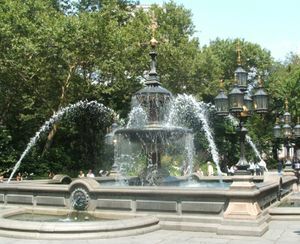 If leaving from Manhattan, you may need to arrive at Battery Park 2 hours before your timed tour to allow for security screening and ferry travel, so it is best to arrive at Battery Park early in the morning. The Statue of Liberty, or Liberty Enlightening the World, a gift from the people of France to celebrate the centennial of the United States, stands upon Liberty Island and is one of the most famous symbols of the nation. Upon departing the ferry, you can visit the Visitor Information Station, which has a schedule of the day's events. Visitors can also meet at the Liberty Island Flagpole (behind the statue) for a ranger-led tour of the island. If you have a reserved Pedestal/Museum ticket -- "Monument" must be printed on your ferry ticket, which requires a second security check -- you can visit the monument lobby, museum (where you'll see various exhibits on the statue, the old torch, and the famous "New Colossus" sonnet), and outside to the promenade and Fort Wood (the 11-point star-shaped structure the statue stands upon). The Pedestal/Museum Ticket includes a trip in the elevator to the pedestal observation deck (not up into the statue itself); visitors can look upward to view the interior of the statue (there are four marked viewing locations); and the pedestal observation deck provides a 360-degree view, which includes the New York City skyline. There are 24 steps between the top of the elevator and the pedestal observation deck; visitors must be able to walk up (and down) these steps to access the pedestal observation deck. Security checks are rigorous, so travel as light as possible. Backpacks and other large bags are not permitted on the tours but can be stored in lockers for a fee. On busy days there may be long waits. Signs on the island state that you should obtain Reserve Pedestal/Museum ("Monument Access") tickets 1 week in advance to guarantee that you will be able to enter the pedestal. Visitors with the Reserve with Crown ticket are allowed to climb up a circular staircase from the base of the statue to the crown, but tickets are very limited and should be reserved three or four months (up to one year) in advance . Visitors will enter the crown in groups of 10 under the direct supervision of a Park Service employee, with no more than 3 groups per hour. Children must be at least 4-feet tall, and must be able to walk up and down the stairs by themselves, and all ticket holders must show a photo ID to match the name on their tickets. Ellis Island  is served by the same ferry as the Statue of Liberty. Ellis Island was home to the nation's primary federal immigration station, with over 12 million immigrant steamship passengers passing through from its opening in 1892 to its closing in 1954. Today, over 40 percent of America's population can trace their ancestry through Ellis Island. The island is home to the American Family Immigration History Center , which contains manifests of 25 million immigrants, passengers, and crew members who entered New York Harbor. Broad Street has several chain eateries. Generally speaking, Lower Manhattan is one of the safest areas of New York City - thanks in part to its prestige status as an international business district and upmarket residential area. The World Trade Center area, for obvious reasons - enjoys a heavy police presence virtually all the time. Because Lower Manhattan is increasingly residential, more and more businesses open late at night therefore the streets are well trodden at most hours of the day. The eastern shore however, close to the Brooklyn Bridge, and underneath its approach viaducts can become rather unwelcoming in the hours of darkness and it is not wise to wander in these areas at night. Lower crime does not however imply zero crime, and the same basic rules that would apply elsewhere in New York should be heeded. This page was last edited on 21 March 2019, at 14:00.